Welcome to world famous Sunset Beach in North Shore Oahu, Hawaii. Settle into your beautifully restored beach house, with 50ft of spectacular white sandy ibeach frontage. Listen as the waves roll in, a gull cries and a gentle breeze stirs the palms. Breathe the fresh ocean air after you have strolled down the small lane that leads to a gated driveway, which offers privacy minus the road noises. Watch as surfers catch a ride on the surf breaks of Kammies, Monster Mush, Rocky Point and Sunset. Recently refurbished, Sunset Beach House consists of two separate structures – the front structure being the main home and the back structure being the guest house, perefct for a large family or 2 families wanting to stay together. The front home features the master bedroom with a queen-size bed, the second bedroom also has a queen bed and there’s a kitchen, living room and bathroom. There’s also a front deck that allows you to soak in the sun or enjoy the breathtaking views. The rear guest house is a sperate structure which has its own private entry and offers 2 bedrooms and a kitchenette, the first bedroom consists of a Queen Bed while the second bedroom consists of 2 twins. There's also a full bathroom which is shared between the 2 bedrooms. A laundry which is shared between the two homes is also available on the property. There are also two championship golf courses located at the Turtle Bay Resort and the historic town of Haleiwa are just a short drive from your holiday home. There is also a grocery store nearby. Whether it’s the big waves of the winter or the tranquil paradise of the summer, this holiday home on Sunset Beach is your ticket to infinite possibilities. At the end of the day, wander outside and discover why Sunset Beach is called just that. Take a deep breath, look out over the ocean and . . . exhale. You’re on vacation. It’s time to relax. It was our second time staying there... beds are super comfortable, great open living space, the lanai and view are genius. Location is wonderful, houses are great! We stayed for a week. The property is in a great location. The first few days the waves were pretty high in front of the house so no swimming, but lots of surfing to watch! We saw whales every morning as we drank our coffee on our deck. We drove to other beaches for swimming. So nice always to have this home to come back to at the end of the day. We would rent again! Such a great place to stay for the week! We had an amazing time staying here. The house is in a prime location. Close to so many food trucks to enjoy and nice beach areas. We got to enjoy amazing sunset views every night. The accommodations were perfect for us. I would definitely recommend a stay here! We loved every minute of our stay there. The house was on a second street of the main highway and was quite comfortable and quiet. There was a gate to pull in your car in. We were looking for a house with three bedrooms and were pleasantly surprised that we had two houses to use. The main house was on the bluff with a front lawn and a stair case to the water. A BBQ out door shower and snorkle mask and fins too use . We cooked many meals there and enjoyed the fabulous view of surfers, paddleboard riders, swimmers along with many rainbows. We did not need air-conditioning the west winds were wonderful. I would book this house again. William Kernot (owner) was very helpful and so were the manager Ken Bradshaw. The Sunset Beach house lived up to expectations and more. From the moment we stepped into the house, we were stunned with the view, the instant beach access, and the wonderful home accommodations. It was spotless and will stay mostly like that if you follow the no shoes in the house policy. Whether you are a swimmer, surfer, or just there to appreciate the beach, it fits all the needs. Our stay was early summer with short to no surf, though we still had a nice break directly in front of the home. Snorkeling out front allowed us to see many fish and even honu (sea turtles). Accommodations were excellent, as stated previously. Beds were comfortable. Kitchen was complete in the front house and more than enough in the back house. Plenty of beach towels were provided. Bathrooms were very clean and functional. Private, gated parking, which is important on Oahu. We stayed as a family of 5 and were more than comfortable between the 2 houses. Grocery store is 5 min drive away and several local food trucks and restaurants 5-10 min away. 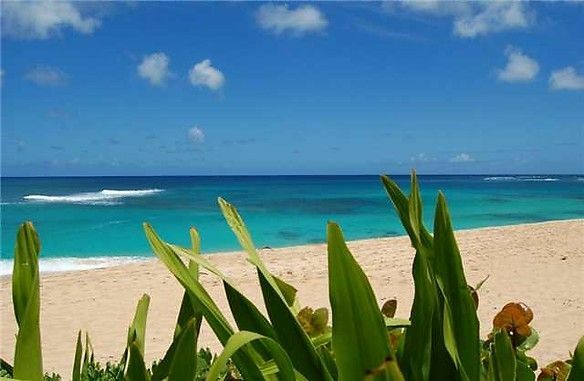 If having the beach in front of the house is not enough, you have a 5-15 min drive to several other North Shore beaches like Shark's Cove, Waimea Bay, Chun's Reef, and Lanikea (where you will find all of the Honu). The property manager lives just behind the house and is welcoming and informative. As far as negatives, there was a bit of a bug problem in the back house, but the home owner responded to our complaint within a day and had the whole property sprayed. The beach in front of the house is eroding, but does not take away from the experience. You just have a few extra uphill steps to take to get back to the door. Neither of these problems would prevent me or my family from renting again. The North Shore is the place to be on Oahu and this house is the best place to stay. Great house. Jaw dropping location and view. We thoroughly enjoyed our stay here. The house was well equipped. Ocean in this location is a bit rough, even in May, so we went up the street for ocean play.